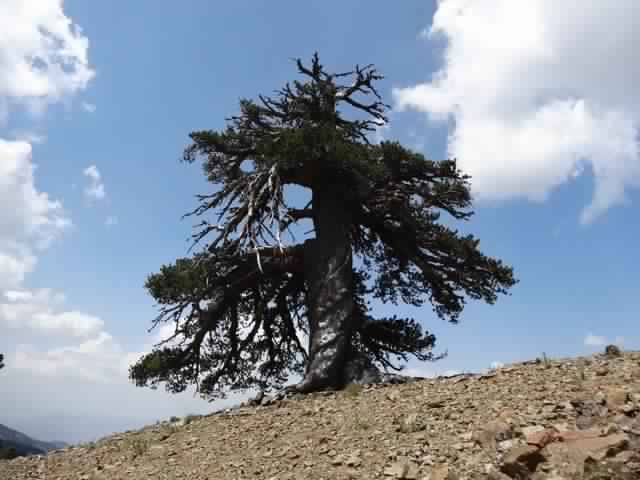 In northern Greece, a Bosnian pine has been dated at more than 1,000 years. High in the Pindos Mountains, a Bosnian pine took root, and 1,075 years later a trio of scientists from Sweden, Germany, and the U.S. have pegged it as the oldest known tree in Europe. Other trees in Europe have larger numbers attached to them, such as the Llangernyw Yew in Wales or Scotland’s Fortingall Yew, which is thought to be around 2,000 to 3,000 years old. The catch is that most of these trees are yews, chestnuts, or clonal trees like them, which reproduce asexually when new shoots fuse with existing ones even after the main trunk dies. The shoots that follow are all connected to the same root system and build off one another, and the individual “trees” that appear rarely last more than a couple hundred years. The tree in Greece, which the team named “Adonis” after the Greek god of beauty and desire, is entirely its own thing. It’s the same tree that took root there over a millennium ago, and without qualifiers. It’s also fairly unique among the old tree club in that the team knows its actual age, as they took a sample from the wood for their research in climatic history and found 1,075 rings from the outside to the center. “It is quite remarkable that this large, complex and impressive organism has survived so long in such an inhospitable environment, in a land that has been civilized for over 3,000 years,” said Paul J. Krusic of Sweden’s Stockholm University and leader of the expedition that found the tree. The tree is one of more than a dozen in the area with ages of over 1,000 years. Who says millennials can’t commit?